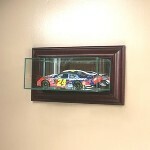 Larger size NASCAR drivers helmet display case featuring a furniture grade solid wood base, real UV protected glass. scale vehicles that are still inside their retail packages. Installed wall brackets to hang. fingers away, as well as dust!